It is a mouth watering traditional Gujarati snack prepared with gram flour and buttermilk and seasoned with sautéed sesame seeds and few other spices. 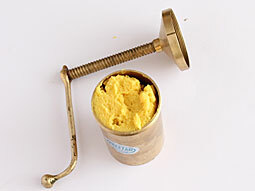 It’s not only easy to make but healthy as well because it just involves steaming gram flour and buttermilk and does not require any other complex cooking techniques. However, you need some basic cooking knowledge to make the khandvi. The simple yet aromatic seasoning of sauteed cumin, mustard, curry leaves, coriander and coconut makes it simply irresistible.This step-by-step photo recipe also provides two different ways to make it. 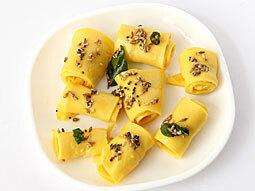 1) Traditional khandvi rolls and 2) Easier khandvi noodles. Use the fresh gram flour (not very old) to make the khandvi. 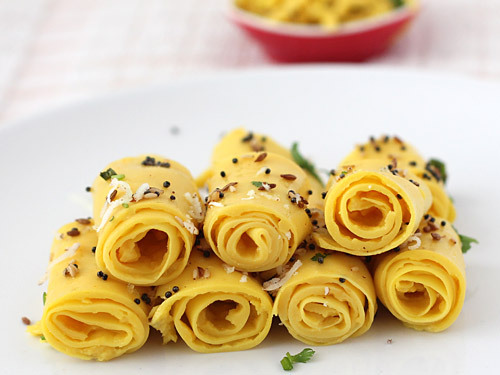 If the flour used is not fresh, khandvi will break while rolling.To check gram flour is fresh enough or not, mix 1 teaspoon gram flour with 1 teaspoon water and if the mixture is sticky enough then it is fresh. Old flour has less stickiness compared to fresh one and it tastes little bit bitter. 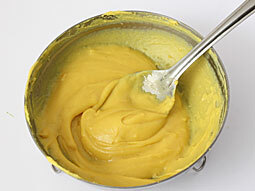 Take gram flour, buttermilk, turmeric powder and salt in a large bowl. 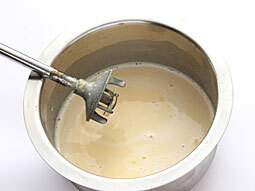 Mix properly and make smooth batter using a hand blender. Grease a large plate or back side of a thali or an aluminum foil with cooking oil and keep aside. Pour batter into a heavy bottomed pan or a kadai and cook on low flame. Keep stirring constantly to avoid lump formation. *Cook until mixture becomes thick and does not taste raw. It will take approx 8 minutes. (Time may vary depending on the thickness of pan and quantity of batter. See tips given below to learn how to check whether batter is cooked or not). 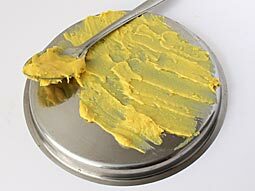 Transfer a large spoonful of batter over previously greased plate or thali. 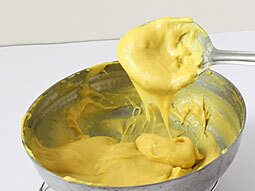 Spread batter in a thin layer with the backside of a flat spoon or a spatula. Depending on the quantity of the batter and size of a plate, you may need 2-3 plates to spread the whole batter. Let it cool for 3-4 minutes. Once cooled, place straight cuts using a knife and make 2″ wide strips. Carefully roll each strip into a roll (like a swiss roll) and transfer them to a serving dish. Heat 2 tablespoons cooking oil in a small tempering pan. Add mustard seeds; when they begin to crackle, add cumin seeds, curry leaves and green chillies and let them cook for around 30-40 seconds. 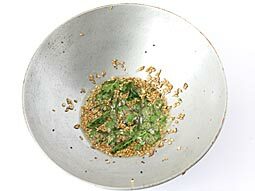 Add sesame seeds only in the end when the sauté is ready. Pour prepared seasoning over khandvi rolls. Sprinkle shredded coconut and chopped coriander leaves. 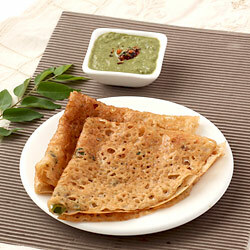 Serve it with a spoonful of green coriander chutney or garlic chutney. Follow the steps 1-4 (from directions-1) and prepare the batter. Cool the batter for few minutes (approx. 4-5 min). 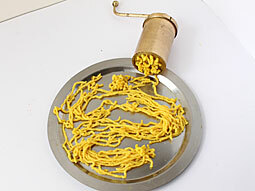 Take a sevai machine and fit the thick sev mould in it. Grease the entire inner surface of machine with oil, fill it with batter and close the lid. Move machine over greased plate and turn its handle continuously to force the batter out through mould (same process as you make a chakli). Let noodles cool for 3-4 minutes. Separate noodle strands carefully and break into small pieces. Transfer them to a serving plate or bowl. 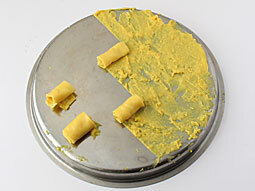 Follow step-8 of directions-1 to prepare the tempering and pour it over khandvi noodles. *To check whether the batter is properly cooked or not, spread a small amount of it (taken from hot batter being cooked) on a small plate having a smooth surface, leave it for a minute or so and then try to peel it and make a roll. If it peels out easily, batter is ready. If sour buttermilk is not available, then mix 1/4 cup sour curd and 3/4 cup water using a blender. Alternatively, use 2 teaspoons lemon juice and normal buttermilk if buttermilk is not sour enough. 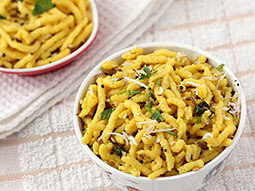 If you are preparing it for the first time, we recommend that you try the second method (noodles type khandvi). It is easier than making rolls. Serving Ideas: Gujarati Khandvi can be served with a mouth watering green mint chutney or date chutney (khajur chutney). Serve it as an evening snack with the tea/coffee or as a side dish for dinner. This snack is healthy and suitable for kids; pack kandvi in their lunch box for a nice surprise. Hi, I follow few recipes and they are good. I tried khandvi with adding madia and it turned out superb - 1 cup chana flour, 1/3 cup maida with 4 cups buttermilk other ingredients are same, just try friends. Made this today. Came out perfect. Glad I found this site. Appreciate the accurateness of the recipe. Which besan to be used jada or barik besan? Response: Barik besan (fine gram flour) is used to make khandvi. Please, may I know how it needs to be stored? Like in fridge or only in air tight container. And how long does it last? The shelf life. Response: Hello Salma, it stays good for 6-8 hours at room temperature (not in summer) and for 1-2 days in the refrigerator (keep it in a container while storing it in fridge to prevent it from drying). i love khandvi and recipe. I like the recipe. It's very helpful. Thanks. I am happy to see this recipe on this site. Thank you very much. I made it today. It was perfect though I made it for the first time. May I add little chilly powder for spiciness? Response: Hi, you can sprinkle chilli powder over top after making the rolls to make it spicy. 1. Even after cooking for a long time I could taste raw besan. 2. I tried to make the rolls. The rolls came nice but they were getting merged while eating. Any advice for next time for both the issues? Response: Hi Richa, if the batter has raw besan smell, it means it is not cooked enough. I think it is the main reason behind both the issues. 1. If you increase the quantity of ingredients, it will take more time to cook. 2. 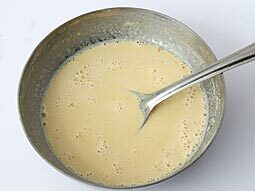 To reduce the time of cooking, initially you can cook the batter over medium flame and stir occasionally. When it starts to thicken, immediately reduce the flame to low. Cook and stir continuously. 3. The main reason behind cooking over low flame is to keep the batter smooth and avoid lump formation. Response: Hi Saba, the reason behind you couldn't make roll may be the gram flour you used. 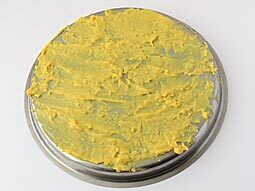 Make sure that gram flour is fresh and not very old. Response: Add approx. 1/4 teaspoon salt while making khandvi batter in step-1. You can also taste the batter for the salt and add more if required. Thanks for the nice recipe. I like the way of recipe presentation with photos. It is really helpful for us that you are also giving photos to understand recipe easily. I don\'t have butter milk can I use yogurt? Response: If you do not have buttermilk no need to worry. You can prepare buttermilk at home by blending 1/4 cup yogurt (curd) with 3/4 cup water using hand blender until no lumps of curd. Response: 1 cup gram flour is equal to 140-150 grams (approx. value). In all recipes, 1 cup = 250 ml (Indian Style Cup) is used to measure all ingredients. You can easily find the measurement cup set in any grocery or kitchen store or online. Thanks for recipes i am getting excited to make.., are you from India? Please tell me thanks. Response: Yes, I am from India. bhut tough tha. perfect nhi bana, but i know practice makes man prefect. Taste was good. Thanx.